Ireland boss Joe Schmidt says anyone who pigeon-holes New Zealand as a flash, expansive side is making a mistake. The back-to-back world champions come to Dublin on Saturday week, looking to claim their 29th Test win over Ireland. The All Blacks have won the Rugby Championship in six of the last seven years and played some scintillating rugby along the way. The highlights reel will show spectacular long-range efforts with a seemingly endless line of speedy backs leaving behind a trail would-be tacklers, all wondering what just flew past. But Kiwi Schmidt, whose Ireland side take on Argentina on Saturday at the Aviva, says the idea that Steve Hansen’s men can’t mix up their game is dangerous. 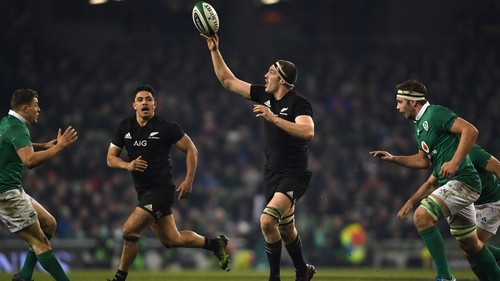 "People get carried away with this romantic notion of how the All Blacks play," Schmidt told RTÉ Sport. "Yes, they can play like that but it’s a danger to just anticipate one way. "In the last World Cup, people talk about how they played; per minute of possession they kicked as many times as we did. "I think it’s really important that you have a good look at the All Blacks before you play them so that you’re not distracted by these notions that people have about the way they play. "When they get up front and physical they are very hard to contain. "We see them but they are very selective about what they bring to a game, and they have a skill and speed to play the game. Even if it’s something someone else has done, they just do it better. "It’s the collective that they have and that ability to play whatever way is demanded to best to get the result. "And if that’s pragmatic, if it’s narrow, if that’s in the air, if it is with the expanse, then the problem you’ve got is that it’s a little bit like predicting the Dublin weather, you don’t know what’s coming and what you currently have can be totally different in five minutes’ time." Watch an extended interview with Joe Schmidt on Guinness Series Live: Ireland v Argentina on RTÉ2 from 5.30pm on Saturday and listen to Saturday Sport on RTÉ Radio 1 for more from the Ireland manager.